In class this past Thursday, guest speaker BJ Koubaroulis had plenty of great things to say. There were a lot of valid points he made, as it is tough to know when to start. 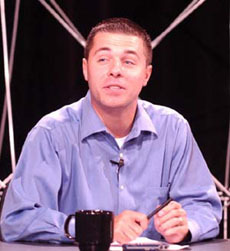 Koubaroulis is a correspondent with The Washington Post and the Play-by-Play Voice of High School and College Sports for Verizon FiOS1 Sports. 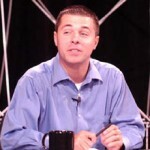 He is the host and producer of “Verbally Committed” – a CBS radio show on Washington D.C.’s 106.7 The Fan and a featured blogger with Sports Illustrated. The first thing he pointed out was that if you want to be successful, you must start out at the very bottom and work your way up. In this process of working your way up, you learn a lot of things and ideas that will help you in the long run. Small experiences help teach you what you need to know and learn these things. To be able to compete in the field of media, you must take on an extra skill, such as video. The more you know, the easier things will be. You should also invest in yourself, as you are your best ally. Koubaroulis really stretched the need to get involved in more than one interest. Once getting involved in the media, you need to know most, if not all of the pieces that go with it. A big message Koubaroulis ended his discussion with was this: Love media, but do not rely on it. What I took from it was to respect all of the qualities it has, but do not trust it. So do your own thing, and do what you have to do in media to be successful here. According to Mark Potts’ “Recovering Journalist,” there’s a rule today that every media-business blogger has to weigh in on the New York Times’ finally announced online subscription plan. In this blog article, Potts goes over this plan, and looks at an analysis done by Felix Salmon. The New York Times introduced this plan on Thursday. The idea of this plan is to begin charging the most frequent users of The New York Times’ Web site $15 for a four-week subscription in a bet that readers will pay for news they are accustomed to getting free. In the analysis, Salmon discusses how the paywall won’t even cover its own development costs for a good two years, and beyond that will never generate enough money to really make a difference to NYTCo revenues. According to Salmon, this move makes no kind of financial sense for the NYT. The upside is limited; the downside is that it ceases to be the paper of record for the world. No one would take that bet. Potts completely agrees with Salmon. As Salmon says, it doesn’t appear this is going to make a material impact on the Times’ finances. There seems to be no point in all of this, except maybe to make some sort of “we must be paid” statement. Potts’ message is this: Just wanting to be paid does not a business model make.